This dispatch from July 17th is coming to you from Serengeti, we met this morning in the lobby of the Sopa Lodge in Serengeti at 4:15 am. A short time later we were driving through the darkness to the departure point for our hot air balloon ride over Serengeti. It was a treat to drive in the early morning darkness, normally in these parks you’re restricted from being out after sunset and before sunrise. We saw several lions in the darkness as we drove towards where the balloons were waiting. Our balloon is called the Timbo and reportedly is the second largest hot air balloon operating in the world. In the early morning chill we crawled into the basket which was lying on its side, we had to work our way into the basket laying down. As we took off it was very spectacular because just as we got in the air and stood up and the balloon was up right, the giant orange ball of the sun rose on the horizon and we had a spectacular ride over the landscape of Serengeti. 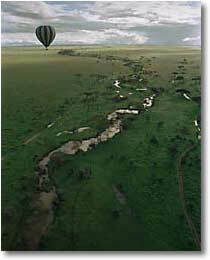 You probably know about the Kojpe, the granite rock out cropping that rise up from the short grass plains of Serengeti. Serengeti of course is a plain created by a layer of volcanic ash and dust and this volcanic outcropping- [unintelligible communication]. The scenery was spectacular as we peacefully floated through the early morning chill. We landed about an hour later, greeted with champagne and drove a short distance by the balloon company to breakfast out in the bush, which was pretty elegant and enjoyable. Since that time we have been with Adam and Raphael, we have just been driving through the vastness of Serengeti. In this dry season in the short grass plains, we have seen very little wildlife, eventually we saw a cheetah. There are always lions sooner or later and of course elephants. We have had a very peaceful day, now with the early departure we are probably a little tired but we are enjoying a picnic out in the bush and we will continue on this afternoon. Tomorrow will be the departure day for Karen and Mary, they will be flying back to Arusha and the rest of us will be continuing on to Ngorongoro Crater.